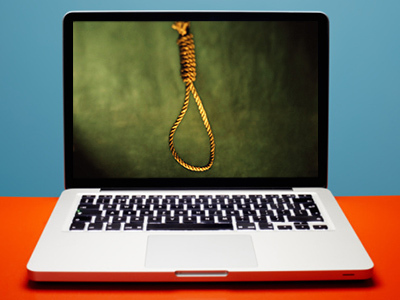 A Japanese man hanged himself in front of a web camera, as forum users continued heated debate over the authenticity of the footage. ­The 24-year old from the northern city of Sendai began streaming live images of himself via Ustream online channel just after midnight on Tuesday. As people logged on to watch, the man made one unsuccessful attempt to hang himself by tying a rope to the pillar of a balcony. Two hours later, at approximately 5:30am, he tried again at a different location and succeeded. Some forum users had been posting messages urging the man to kill himself, while others attempted to talk him out of it.The streaming service was interrupted shortly after 6am, following calls to the police. Officers arrived at 8am to find the man dead. He had been suspended from duty at a bank since August, and a week prior to his suicide had posted messages announcing his plan to take his own life.